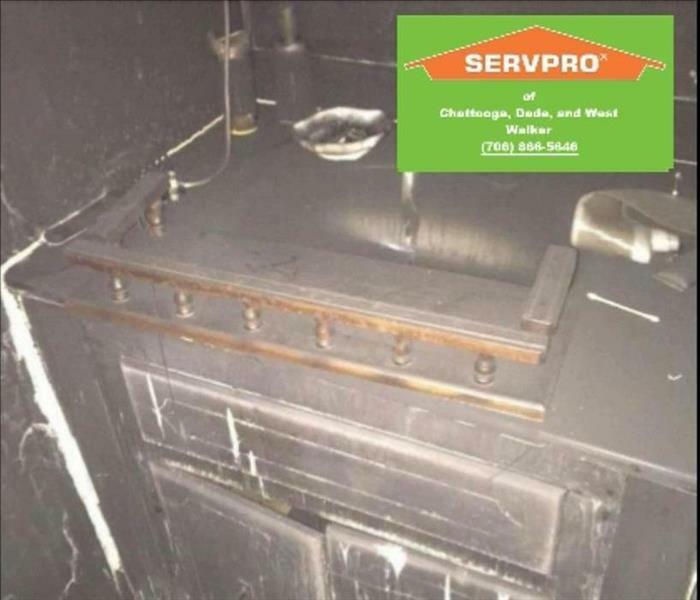 One of the many professional services SERVPRO offers is fire damage restoration. Our team is trained to handle any type of damage caused by fires. One of the main issues that will come from indoor fires is the smoke that spreads far beyond where the fire can reach. There are many types of soot. In the above photo, the damage was from a fire started from a malfunctioning electric heating unit inside a wall. Luckily, the homeowner called SERVPRO and we were on the job right on schedule! 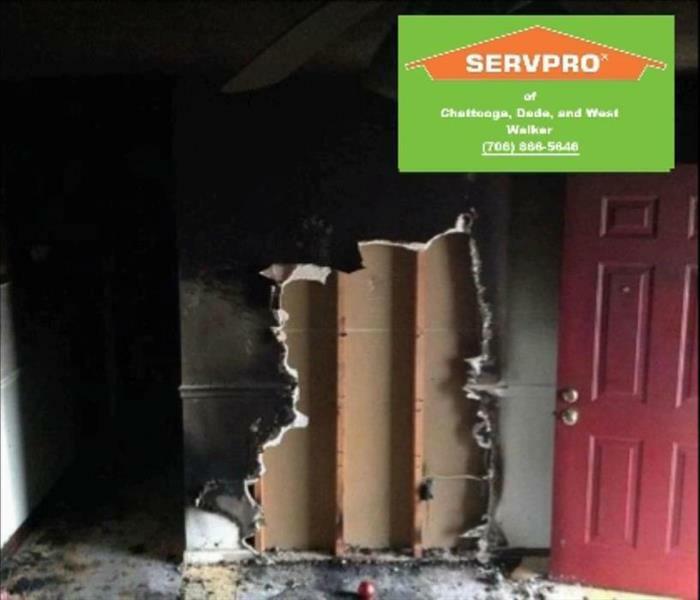 If you have a fire damage call SERVPRO! When it comes to technology, SERVPRO likes to stay up-to-date on the latest and greatest. We use thermal imaging to detect harder-to-find water damaged areas. With this technology, we are able to see within the walls of the home without having to do experimental demolition. This means less cleanup for the homeowner. As you can see from the photo, the thermal imaging camera shows what wouldn't be seen with the naked eye. After we come in and perform water extraction, there is still work to be done! Thanks to the thermal imaging camera, we are able to detect where the water damage extends so there is no additional demolition needed than necessary. 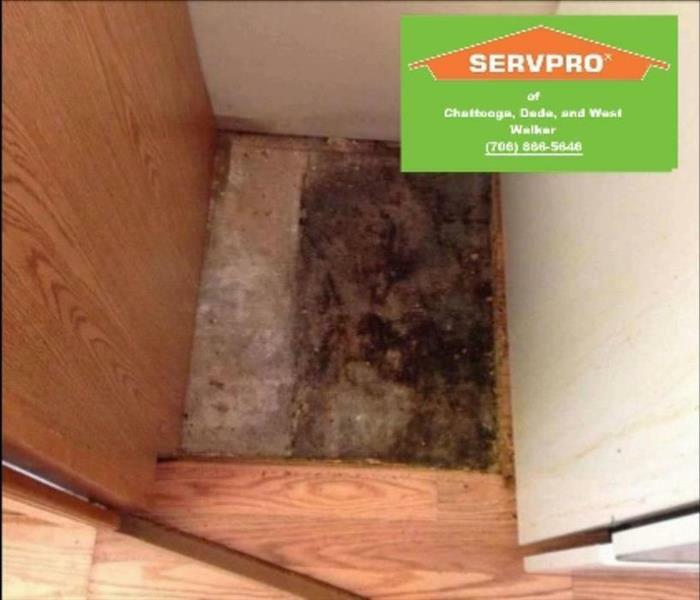 This is one of the many ways SERVPRO is always improving to make your disaster "Like it never even happened." Flooding and water damage can present many issues. Aside from the obvious physical damage, affected items can be lost causing emotional pain as well. SERVPRO knows how difficult these times can be. Our goal is to make fixing your loss as seamless and pain-free as possible. According to research, homeowners file claims roughly once every ten years. Pictured, you will see a gutted out room. 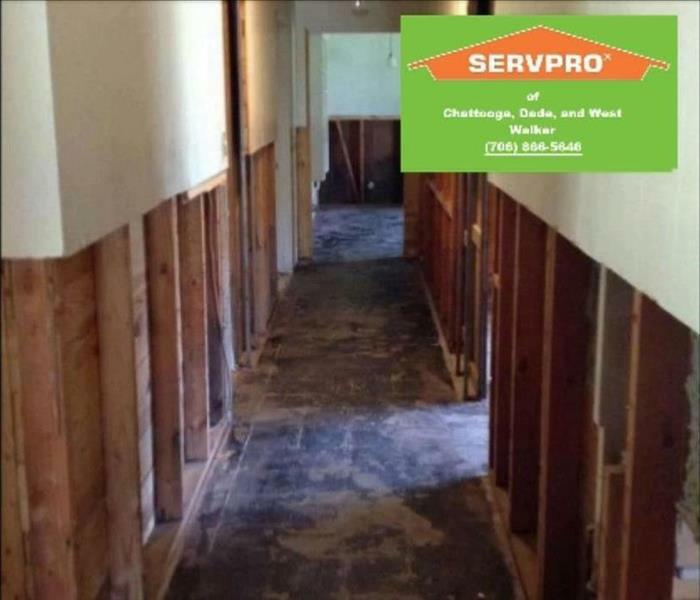 SERVPRO operates to ensure no issues arise down the road so your damage timeline is short and so no complications occur down the road. If your walls are affected by microbial growth or "black water" we cut out two feet above the damage to prevent issues further down the road. Difference in how you see damage.. 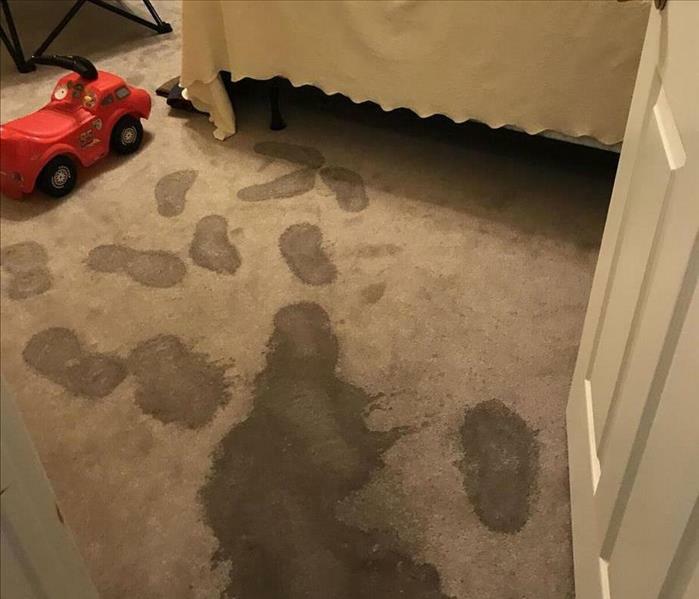 Anyone can tell when carpet is wet. If not by the way the color of carpet changes, it feels wet. Hardwood flooring is very different. If liquid is not coming from a spill from the top, you can't spot moisture in hardwood until the floors begin buckling. That's where our training and procedures come into play. 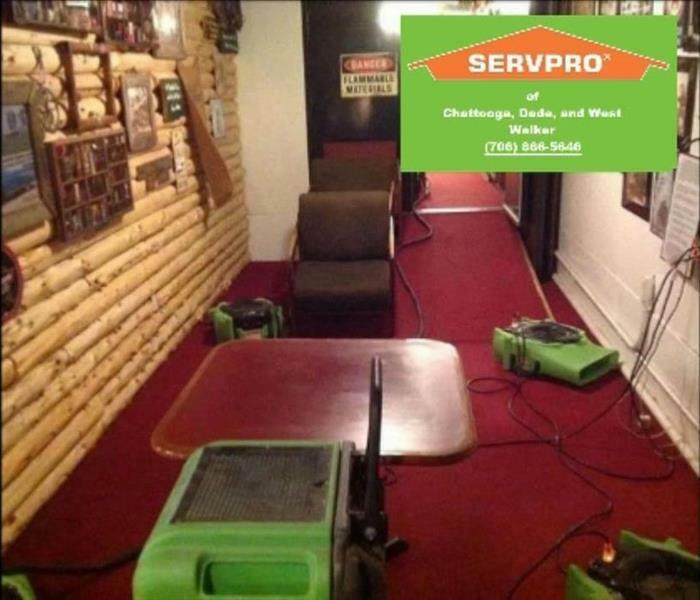 SERVPRO is specially trained to identify and dry every affected part of your home. Where the normal eye can't see moisture, we have tools that can find affected areas for us to dry. In the above photo, you can see where we had to remove the flooring due to unrepairable damage. Here at SERVPRO we also do construction. When flooring must be removed due to damage, we can replace it under one smooth, unified process. 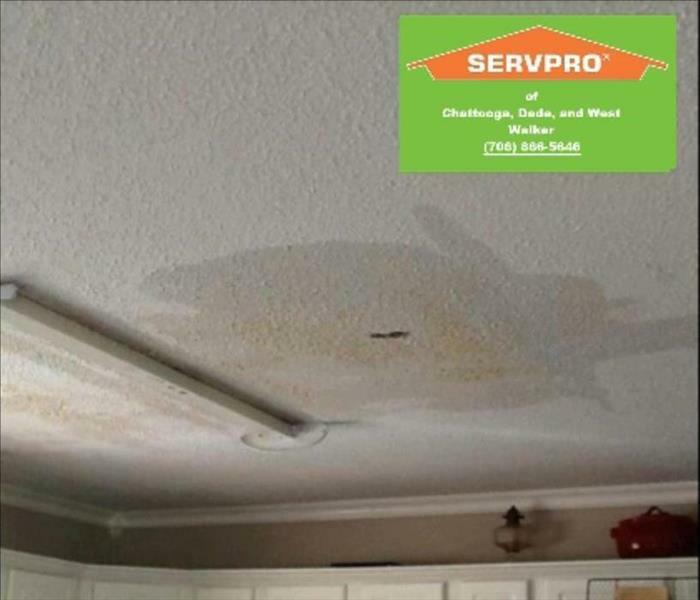 If you have water damage, call SERVPRO! 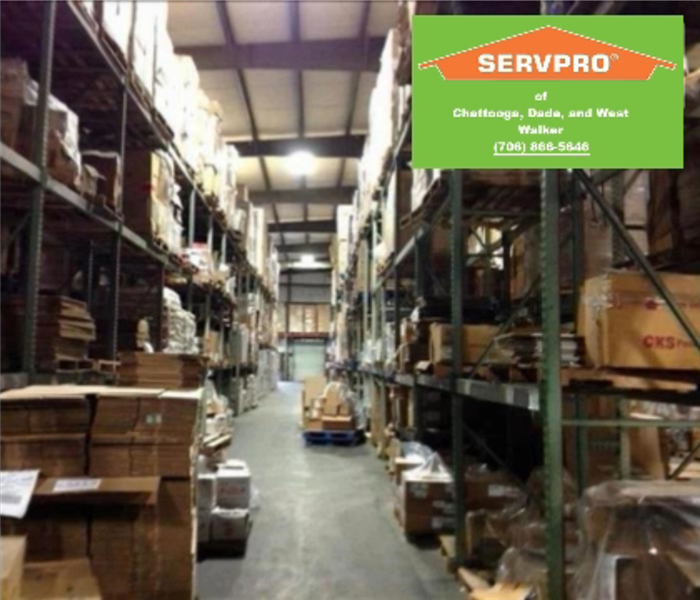 Did you know that SERVPRO is a national brand with over 1700 locally owned and operated franchises? We have the capacity to handle any problem large or small. We know that staying open without interruption is important to the success of your business. 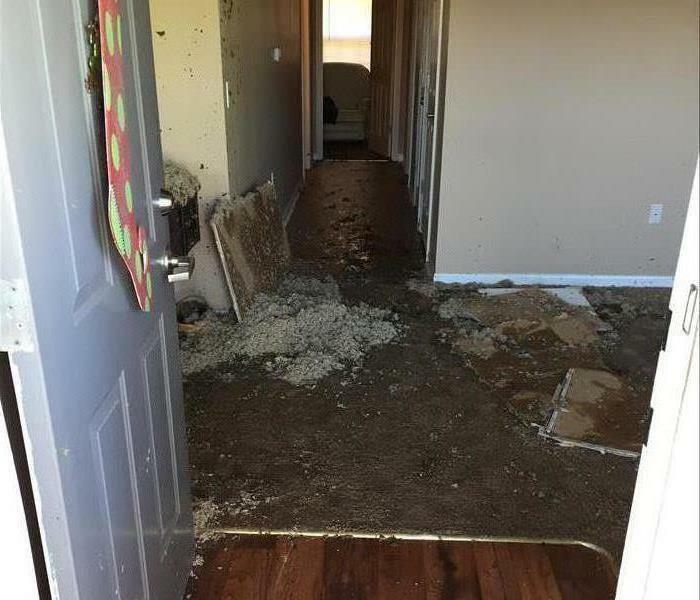 In this case, an apartment building had three rooms affected by a busted pipe. You can see the result of the damage in the photo. 40% of small business do not reopen after disaster. SERVPRO is here to ensure your business does not become a statistic. 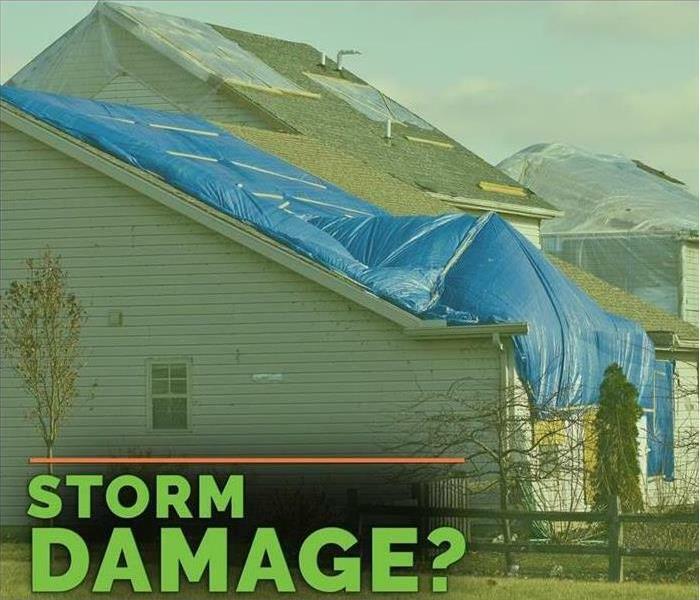 Here at SERVPRO of Chattooga, Dade, and West Walker Counties we are a part of a storm team that boasts a 4 hour response time. 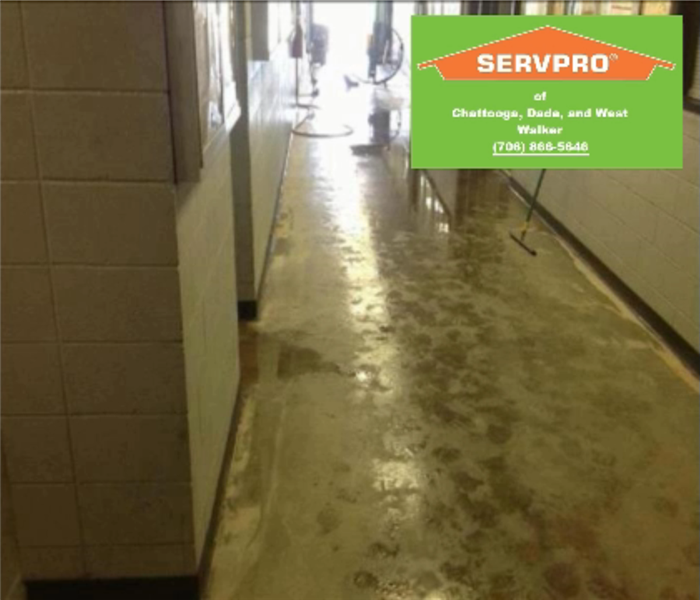 So if your large or small business has a water, fire, mold, or storm related issue call SERVPRO! Normally, attics operate under the "out of sight, out of mind" rule. We only visit the attic to find old pictures or to get the Christmas Tree out every year. Sometimes we even forget the attic exists and we might leave it alone for weeks at a time. That is the case in the photo above. In an unheated attic, pipes fell victim to chilly temperatures and busted. 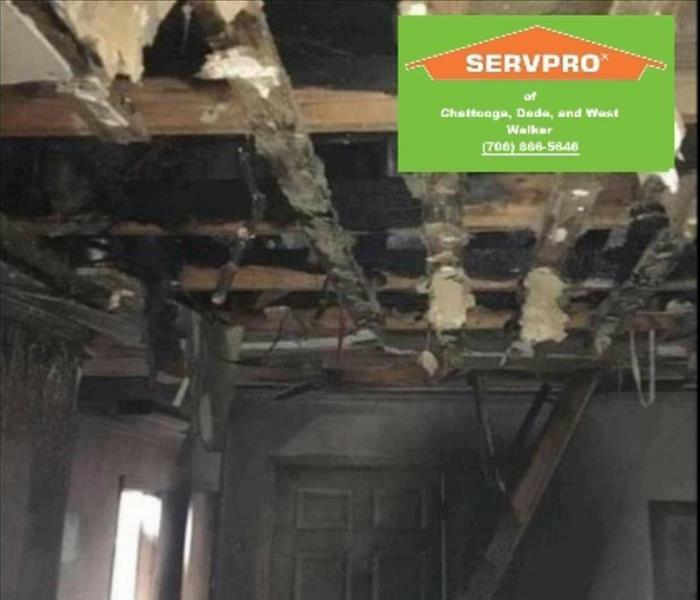 Luckily SERVPRO was on the scene ready to help! 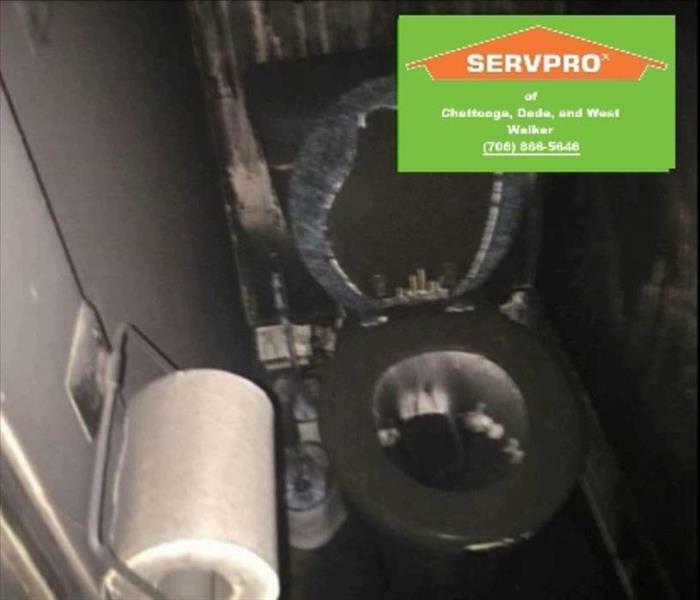 If you have a water, fire or mold problem, call SERVPRO! This loss came as a result of a refrigerator supply line busting. The homeowner tried to clean the water, but the water never stopped coming. SERVPRO came in, assessed the situation, and laid down the drying equipment seen in the above photo. We were in and out of the house in less than a week and customer was very appreciative of our work! NEVER BE WORRIED ABOUT THE WRONG THING! 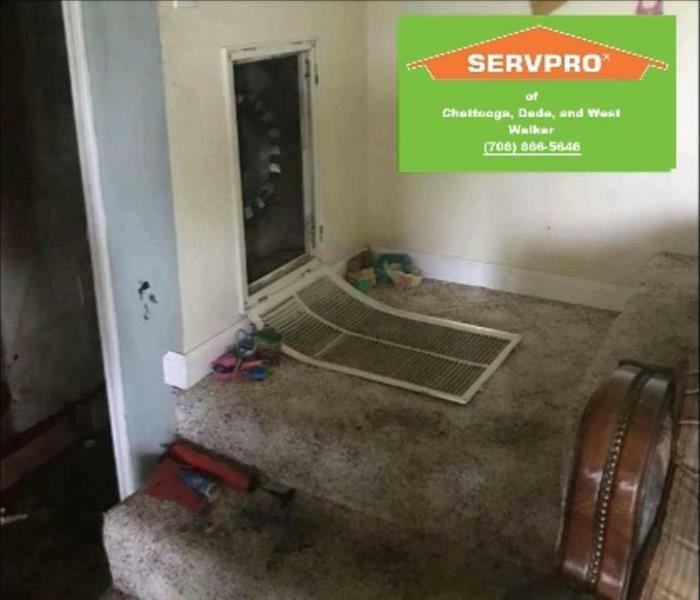 At SERVPRO we remove the worry from your disaster. Business buildings and homes are subject to wear and tear over the years. A primary cause of in-building disasters is the erosion of pipes and roofs. If you experience a loss, SERVPRO can take the worry out of your disaster. This photo was taken at a luncheon where we were able to talk about the importance of our ERP program- a service the allows us to serve you quicker and more efficiently! When we are doing work it is often in homes. We know that we must earn and work to keep trust with our customers, and that we must be good Samaritan’s every day and on every job. When a disaster occurs in your home or office, our experienced crews walk through the process with you. 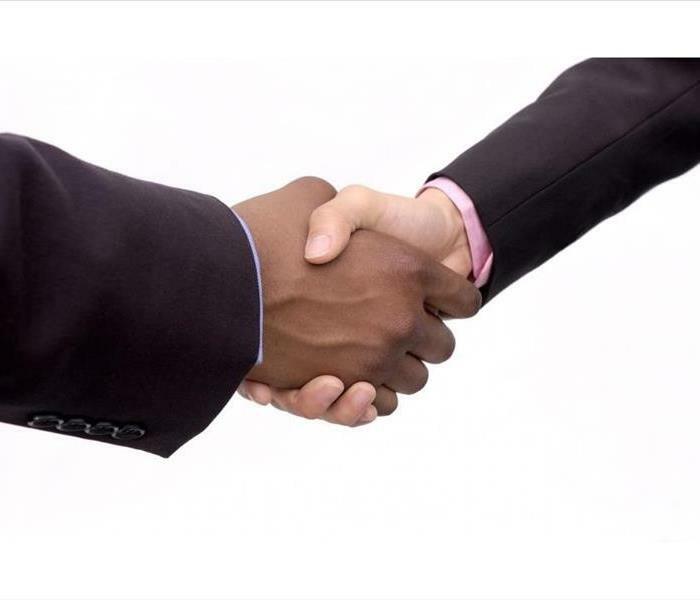 They assist in answering questions, bridging the gap between you and your insurance. We strive to ensure that all necessary parties have the information needed to complete the job faster and get you back to life before. Different kinds of home fires..
We all know about the kitchen fires, the cigarette fires, and the electrical fires that cause severe damage in homes. There is another kind of fire that causes over 34% of home fires each year: Dryer Vents. Failure to clean these drying vents are causing more and more fire damage in homes each year. The facts do not lie, FEMA reports: "2,900 home clothes dryer fires are reported each year and cause an estimated 5 deaths, 100 injuries, and $35 million in property loss." That's a staggering statistic. If you want to see a video of us in action cleaning a dryer vent, check out this link! 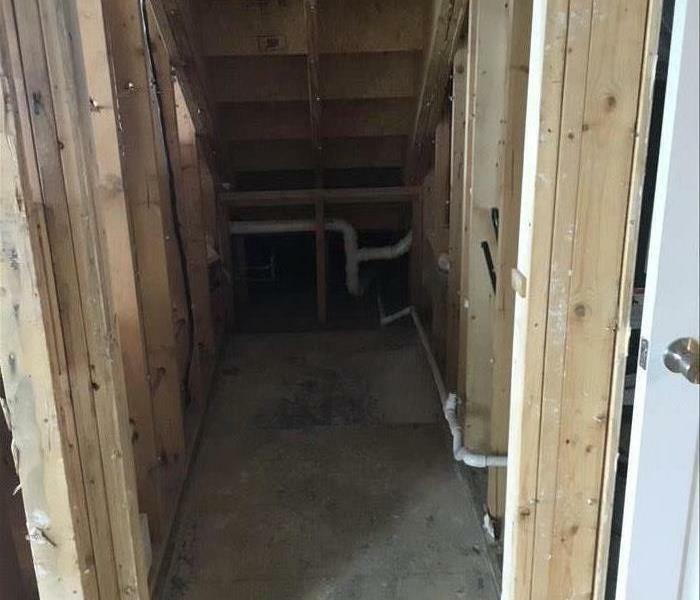 This before and after of a flooded basement was a result of a broken supply line. The water line that supplied the refrigerator broke and water began running to the lower levels of the home. As you can see in the photo, at some points the water was 1/2 an inch deep. SERVPRO was able to come in and dry this home. We were in and out within a week and our customer was very pleased with the results! Inside, mold spores in excess can cause issues. If mold spores make it inside your home, they tend to find wet areas and will reproduce there. There are microbial spore counts everywhere you go, but if those counts are high enough it could spell disaster. Aside from possible negative health effects, mold could weaken your walls, ceilings, floors, and structure. According to the Center for Disease Control, mold will affect everyone in different ways. Some more or less severe than others. No matter who, though, mold is a problem that needs to be dealt with as soon as it is presented as an issue. 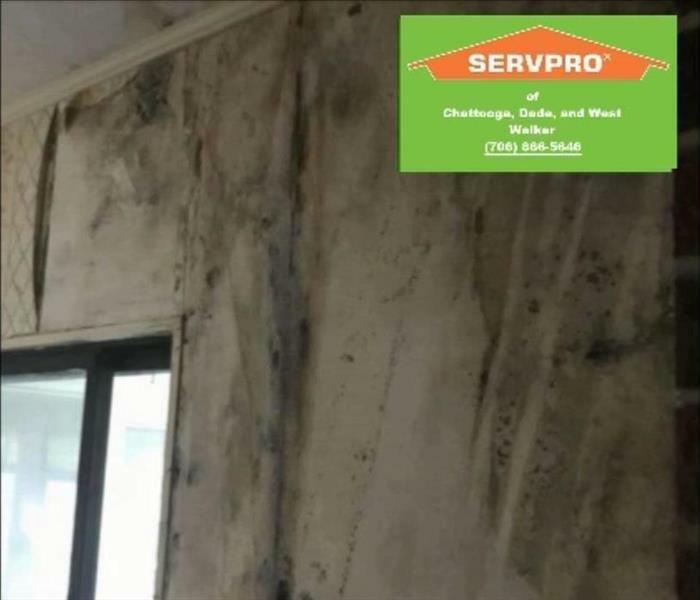 SERVPRO of Chattooga, Dade, and West Walker Counties is trained to help you if you find yourself dealing with mold. We are trained and certified through The Institute of Inspection, Cleaning, and Restoration Certification (IICRC). Baking-soda abrasive blasting effectively removes mold, soot, dirt or other contaminants while minimizing damage to the underlying surface. The baking soda used in soda-blasting is soft but angular, appearing knife-like under a microscope. Baking soda is water-soluble and also effectively absorbs odors. When the proper equipment setup (correct nozzles, media regulators, hoses, etc.) and technique (proper air flow, pressure, angle of attack, etc.) are used, the process allows for fast and efficient removal of contaminants with a minimum of damage, waste and cleanup. 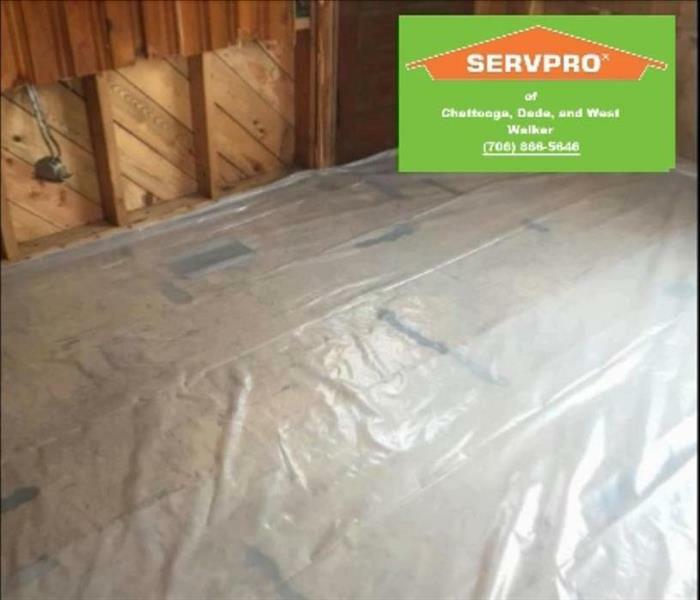 This service is one of the tools that SERVPRO uses to help you during your times of need! The beginning of 2018 saw the weather create problems for many people. 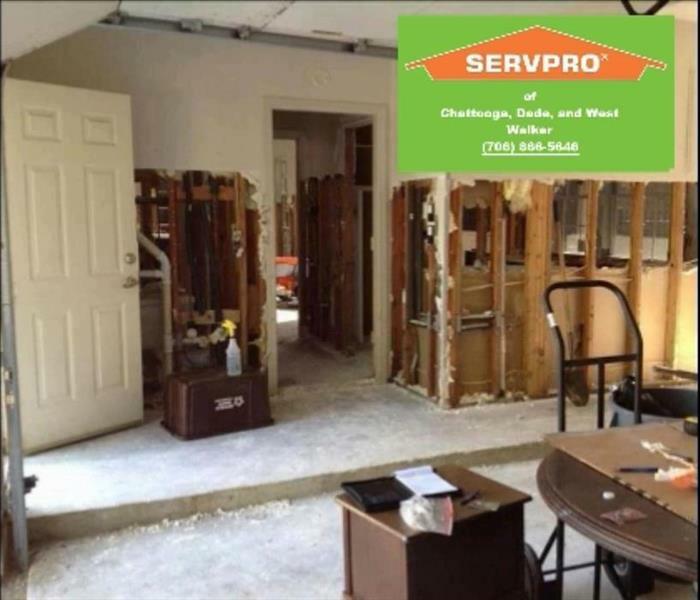 We are a part of a national SERVPRO storm team, and in January of 2018 we suited up and headed to aid in the floods that covered the north. This photo was taken from the basement of a coffee shop whose foundation was cracked which led to water seeping through the slits. A state of emergency was issued throughout Kentucky and the flooding affected 17 counties statewide. Other states on the Ohio River also received record-breaking flood heights. The process went seamlessly and we were able to get in and out in a week! 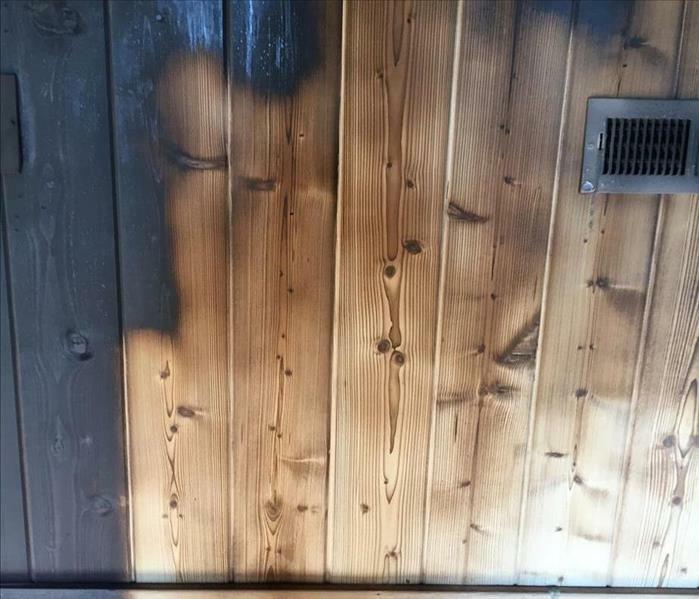 A candle left too close to a curtain started a fire in this kitchen. Not only was the kitchen affected, but the whole house was heavily damaged by soot. After assessing the situation we began removing the non-restorable affected materials. Once we had removed those materials and cleaned the high value structural items, our construction crew took over and began the process of putting the house back together. Once completed, the mitigation crew stepped back in and finished the cleaning process. Having a company that can coordinate the whole process from start to finish makes your life easier, and gets you back in your home faster. This job, which at first glance looks to be a relatively small mold job, turned out to be the whole basement area. Why? A small leak can raise humidity levels in the home to the point where mold growth occurs in areas thought to be unaffected. 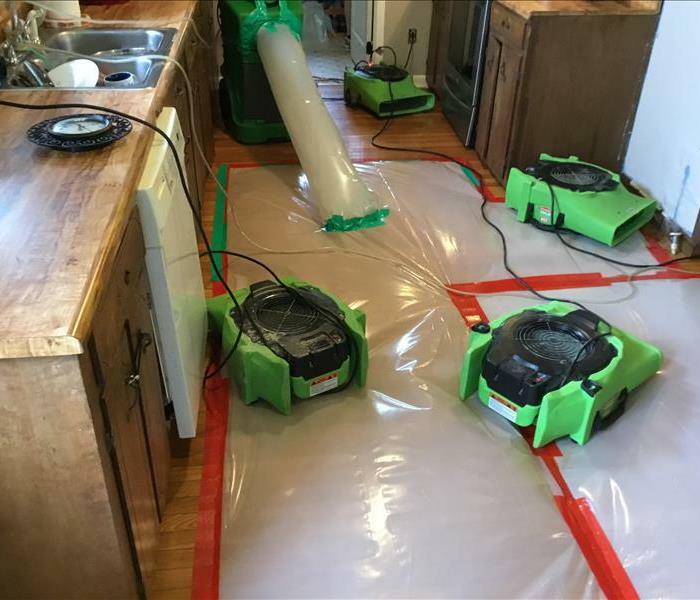 Remediating the entire floor of a building can be a daunting task when the customers insist on living in the home while services are being performed. But, through careful planning and execution, it can be done. "Busted pipes" is the name of the game this year. Recently, there has been an onslaught of pipes busting due to extremely low temperatures. There are a few precautions one can take to prevent pipes freezing, but sometimes accidents occur. In this case, an upstairs supply line froze and leaked through the floor. From the photo you can tell the water built up in the ceiling and fell along with light fixtures and insulation. Our customer was ready to get this problem taken care of immediately! While the customer was away over the weekend, the hot water heater had busted. The extent of the damage reached many rooms including the basement. During the winter months, busted pipes become an increasingly prominent issue. 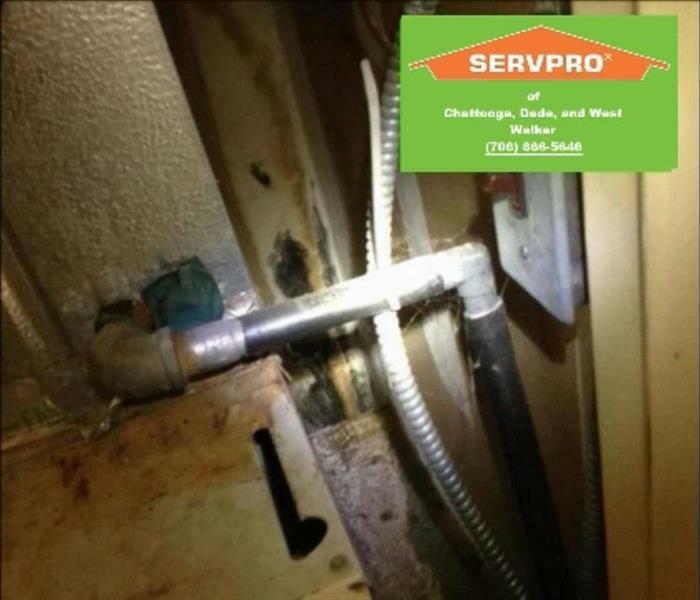 SERVPRO has written a blog on precautions to take preventing freezing pipes in your home or business. The link to that blog is linked here! 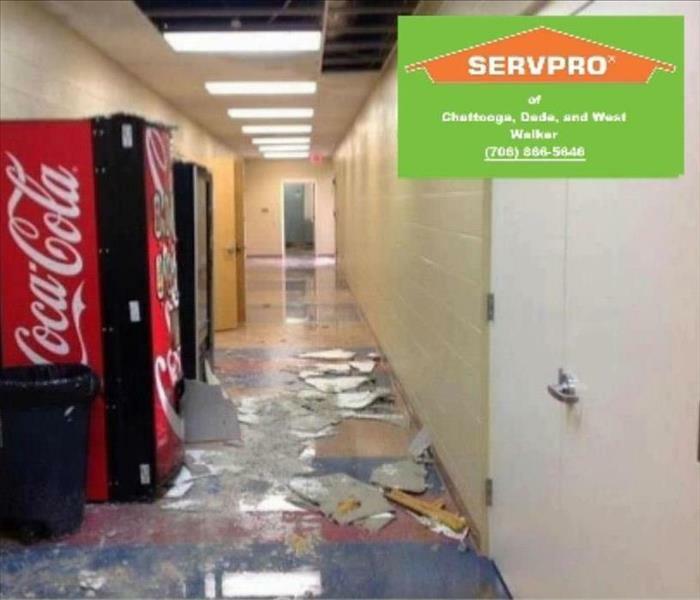 Call SERVPRO of Chattooga, Dade, and West Walker Counties today if you have any signs of water damage! We are here to help! Upkeep of your home is of the upmost importance to prevent excessive water damage, mold, or even structural damage. This lookout mountain attic had gone unused and unseen for an extended period of time. As a result, the roof leak had allowed an excessive amount of water in the insulation and walls. Even though the leak was small, the damage was great. In the first week of the year, temperatures hovered under the danger zone for frozen pipes. With temperatures under 20 degrees Fahrenheit, pipes are heavily at risk of freezing. In this case, we arrived on the job to water being spread throughout the home from a busted pipe. The busted pipe originated in an unfinished attic. During winter, there are some precautions to take to prevent frozen pipes. See our tips here. The water damage reached two floors and affected multiple rooms. In addition to the 35 car pileup on the interstate, Lookout Mountain also saw some heavy sleet coverage all over the roads. This picture was taken after the roads were salted to improve conditions. The temperature combined with sleet, basically a rain of miniature ice pellets, makes for conditions where one constantly slips across the surface of the road. There were no reported injuries even though there were a multitude of wrecks over the course of the day. We are a proud member of our community, and we hope everyone stays safe in their travels this winter season. This community recreational center took on several inches of water after a pipe in the ceiling busted. We were able to respond within 30 minutes of the initial phone call. After assessing the damage, we began to extract the standing water and set drying equipment. The entire structure was properly dried and no structural materials, including this gym floor needed any further repairs beyond our drying services. Restoration is always cheaper than replacement ad timely mitigation is key to getting you back in business and on with your life quickly. Don't let a slow response or a do it yourself mentality cost you in the long run. When this homeowner walked into the kitchen, water was seeping up thru the mortar of the ceramic tiles. 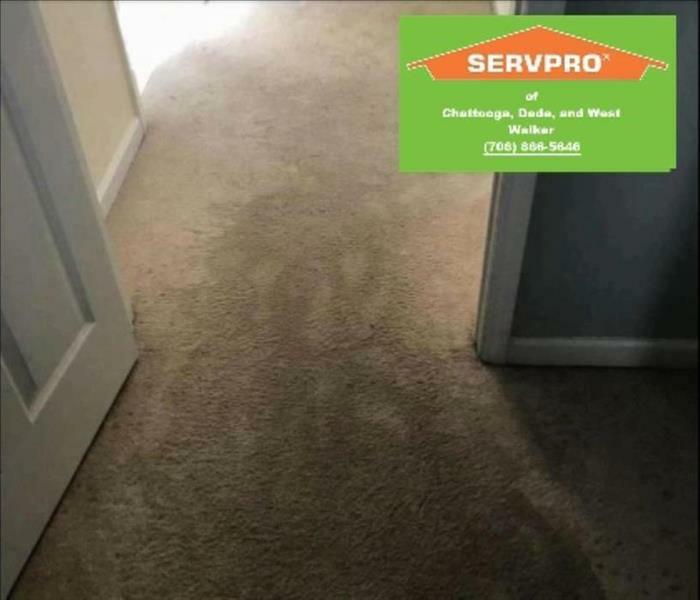 The homeowner did not know how long this had been happening so SERVPRO was immediately called! When the tile was pulled it revealed what you see in the picture. This was the result of a dishwasher leak the homeowner did not notice until it resulted in the picture you see here. This photo is from one of our employee's video of Harvey's flood waters. According to The Weather Channel, Harvey began off the coast of Africa in early August. As time progressed, the storm lost momentum and then regained it before it made landfall in The U.S. in later August/early September. According to The Balance, Harvey caused $180 billion in damages which ranks it as the second-most costly hurricane in American history. Our hearts go out to the victims of this disaster. A link to donate to this tragedy has been linked below. This was a result of a loss coming from the hot water heater. Three rooms were affected by the leak. We had to remove the flooring and move in air movers to dry the area! The basement below was not affected and we were able to contain the issue to the original three rooms. The owner was very pleased with our work as we ensured the mess looked like "it never even happened." What you see here is our fans at work! After a hot water heater pipe bursting, we arrived on the scene to over 1 1/2 inches of sitting water in some areas! Needless to say, there was significant water damage that needed to be cleaned and dried out. We were in an out of the lodge within a week, and we were happy to make that disaster seem "Like it never even happened." 2017 saw some heavy floods and natural disasters. Flood waters accounted for some very heavy damage. 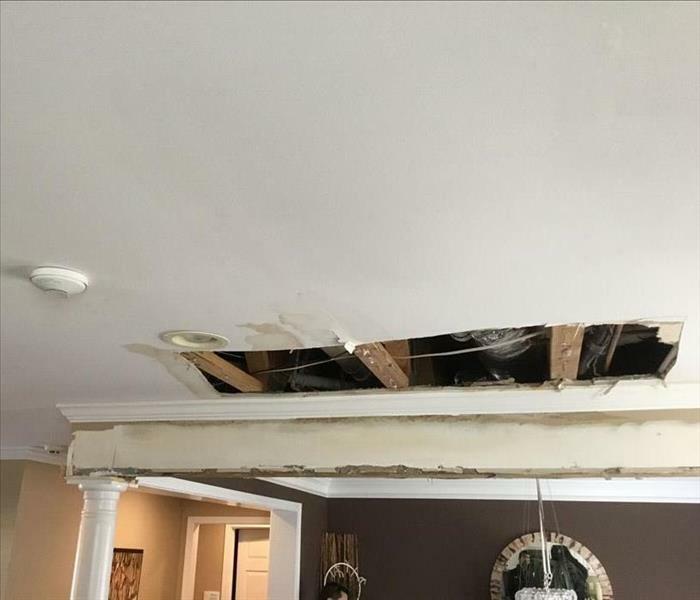 In this case, flood waters rose from the streets into homes resulting in water damage that reached heights as tall as the technicians working the job! We were able to be in and out of the house in less than a week! 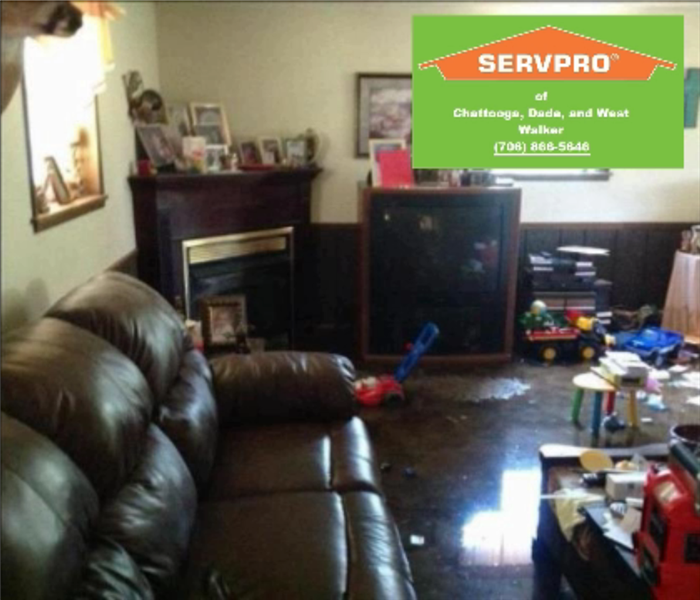 Call SERVPRO today to make sure your disaster feels "Like it never even happened." 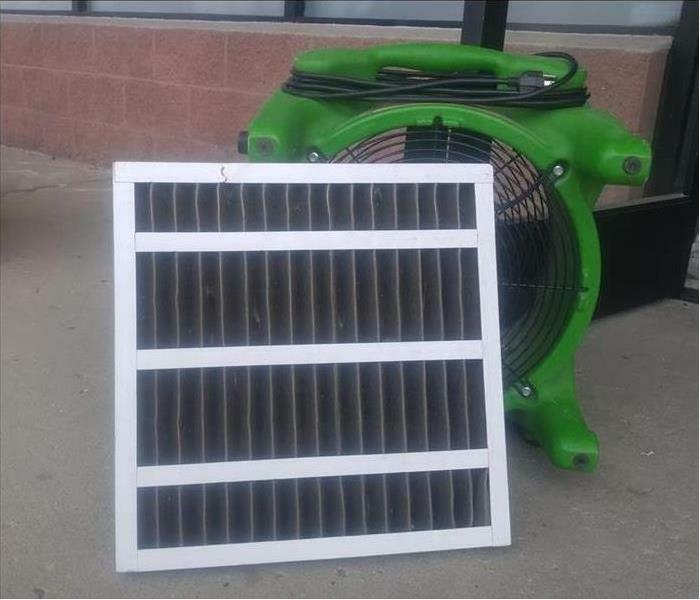 One of the many questions we get while performing jobs is why we sometimes use air filtration equipment. When handling demolition, proper air filtration helps control dust and debris stirred up during demolition that can cause health effects on people and pets. According to a Pro Construction Guide article, even something as simple as normal construction dust could carry Aspergillosis- an airborne sickness that causes fever and coughing up blood (Mayo Clinic). The above photo is an air mover with an HVAC air filter to illustrate how dirty a job area can be! This was the aftermath of a house fire that affected the entire upstairs floor of a home. 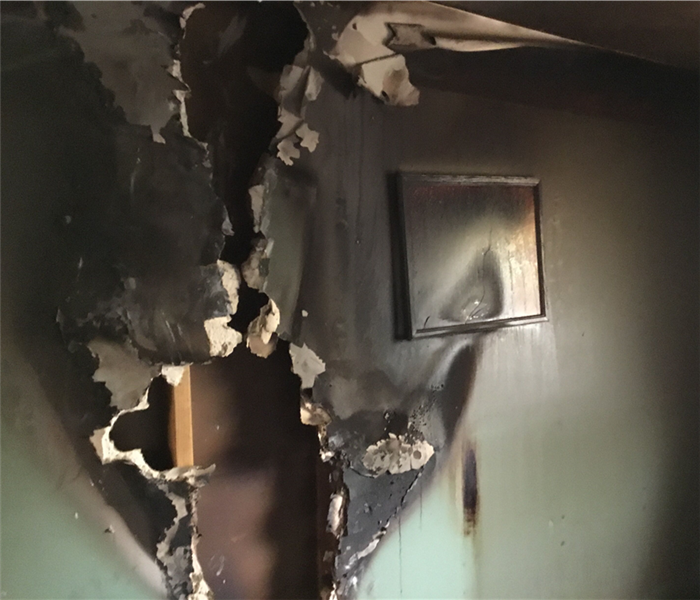 Even though the fire didn't reach this bathroom, smoke and soot significantly damaged this room. This job took a while to complete due to the extent of the damage. After the job was completed, the construction crews came in and finished the job making sure the disaster appeared "Like it never even happened." This was the aftermath of a fire that spread throughout the home. When we arrived, almost every inch of the home was either affected by smoke, soot, or the fire itself. It took us less than 10 days to clean and remove the damage caused by the fire. We worked quickly and efficiently to ensure this disaster appeared "Like it never even happened." This is some of the damage that the flooding from Hurricane Harvey. There was significant damage throughout the house that sometimes reached up to 6 feet in height. Our crews are still in the wake Hurricane Harvey for the recovery effort, and in the process of remediation where we can! This was truly an incredibly terrible disaster and our thoughts are with those affected. With the recent events around The Gulf of Mexico, the SERVPRO team has been dispatched for storm relief efforts down in Houston. Not everyone can make it to the disaster area to help with storm relief though. The American Red Cross has setup a donation fund to those who were affected by Hurricane Harvey. If possible, any donations are going to be greatly appreciated by the victims of this storm. 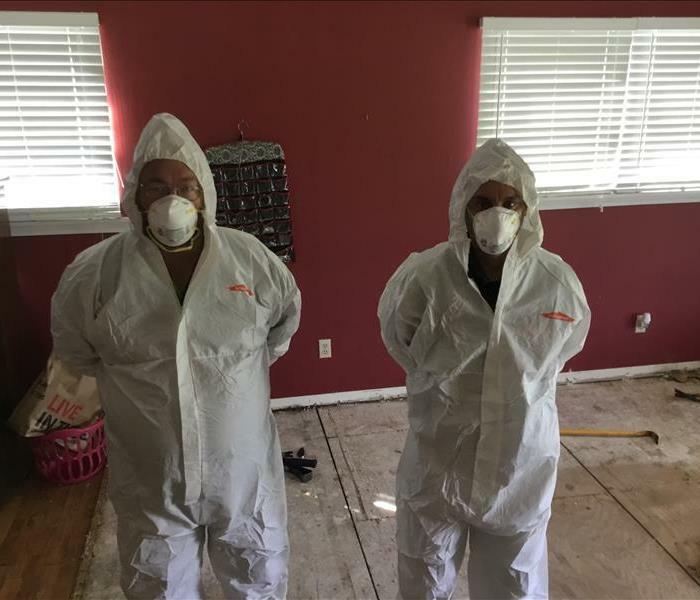 This infestation of mold was so severe that the drywall and flooring had to be taken down! We stripped this spot in a house full of the nasty mold, and the affected areas were sealed and cleaned in no time. 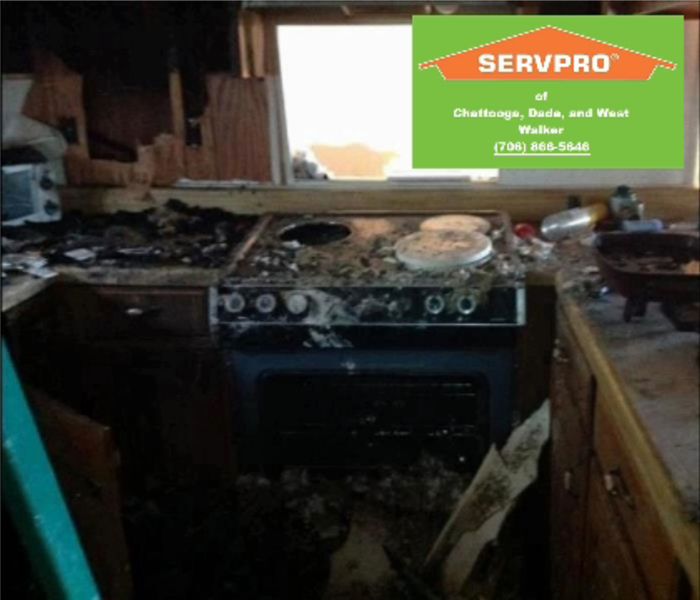 We are always ready to help here at SERVPRO to ensure your disaster feels "Like it never even happened." This is the aftermath of a house fire that damaged the entire upstairs of a home. As you can see from the picture, there was incredible smoke and soot damage even though the fire didn't reach this room itself. Once we were through, the owner could not believe how much we had repaired. It is our goal here at SERVPRO to ensure your disaster feels "Like it never even happened." 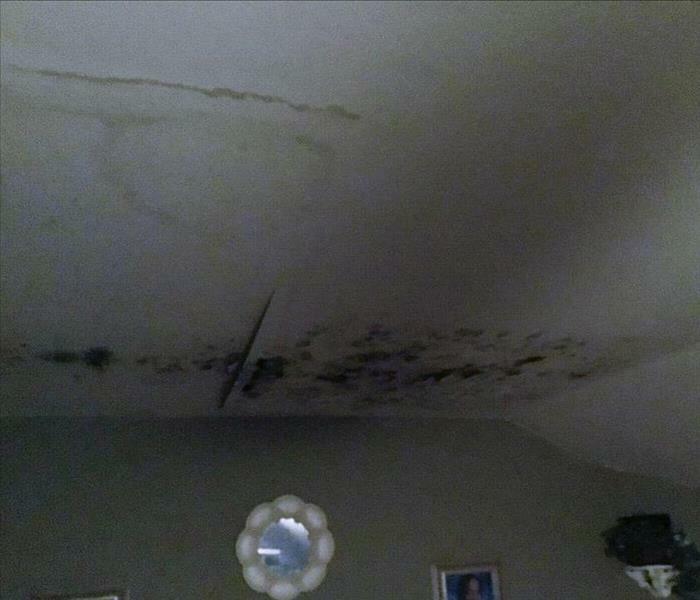 This wet ceiling was the result of an upstairs bathroom pipe seal leakage. In addition to flooding the upstairs bathroom, the leak extended down to the ceiling of the lower floor. We were in and out in a week ensuring the owner would be taken care of in a timely manner! If you are experiencing water damage, fire damage, or mold growth, do not be afraid to call us today! 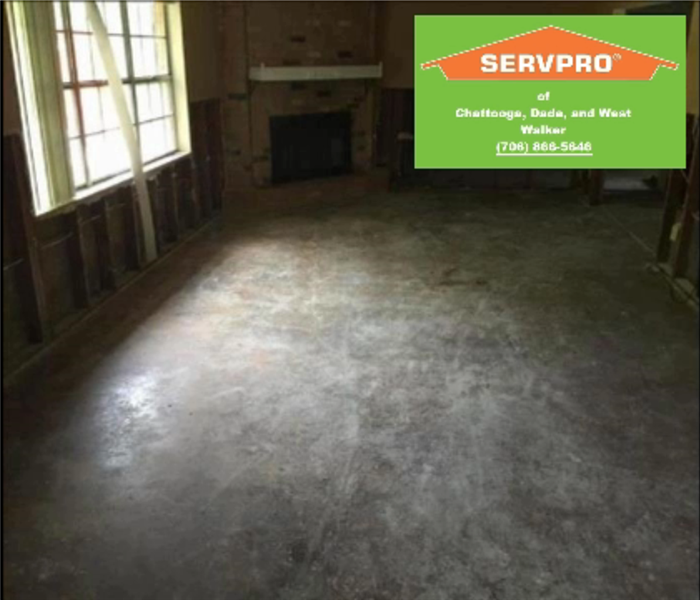 SERVPRO of Chattooga, Dade, and West Walker Counties is here to help! Installing an HVAC system can be difficult! This is the aftermath of an installation mishap. When we arrived on the scene the majority of this building was completely affected by the fire. 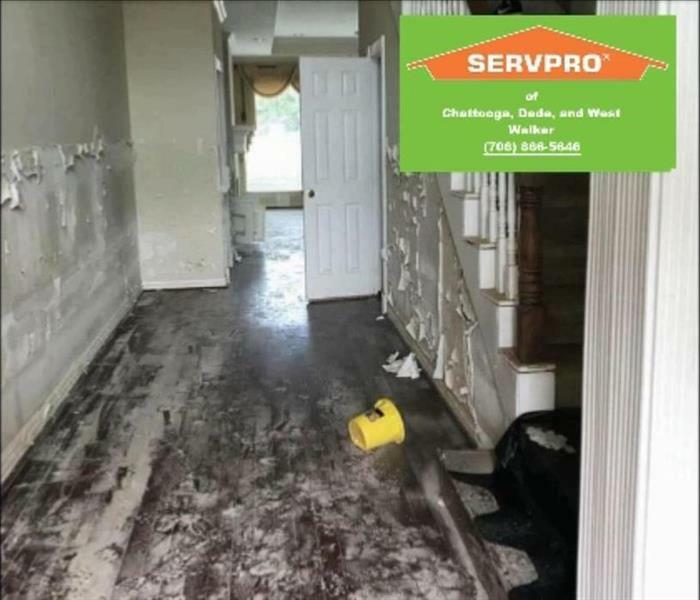 Our SERVPRO franchise was called to this job to ensure this disaster appear "Like it never even happened." This picture was taken after a storm in The Fall of 2015. Heavy Rainfall had caused a roof leakage on this building and thus created water damage all throughout the building. This is one of the more severe cases of damage that occurred in all of the rooms. It was a larger loss so SERVPRO's storm response team made it only three hours after we got the call! We were able to be in and out of the place in around a week! 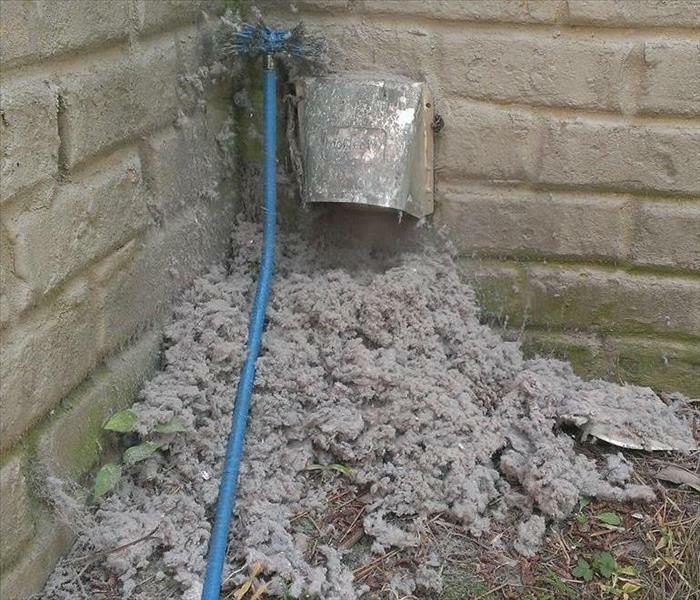 This is the result of a long-existing leak originating from a utility room clothes washer. The utility room bordered a kitchen that sat atop the basement where this photo was taken. The leak first affected the kitchen cabinets. Then, over time mold growth began under the cabinet both on the floor of the kitchen and on the ceiling of the basement level below. 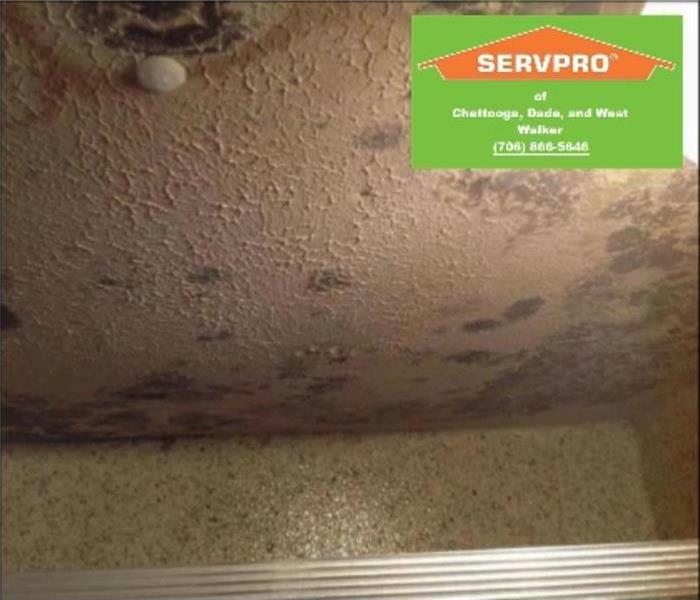 If you think you see water damage or mold growth, don't be afraid to call us today! This loss was a result of a busted high pressure pipe in the ducts of a building. The leak spread through multiple rooms in the building, but only took four days to rectify through drying and ripping up affected carpet. Our efficiency and devotion to quality pleased our client while we made the job site truly "Like it never even happened." This photo is a part of an ongoing project! This problem is a result of a broken supply line to a kitchen sink. There was significant residual water damage on the floor. We are currently working on this project to ensure we make this problem "Like it never even happened." Fires can begin when you least expect them. Their detrimental reach can also spread quickly to all parts of your home. The dispersal of heat and smoke resulted in these stairs being damaged with black soot. Once, finished with the restoration, the owner could not believe the results! This was the aftermath of flooding in Louisiana in 2016. Low elevations paired with high amounts of rain caused extensive flooding in streets, businesses, and homes. 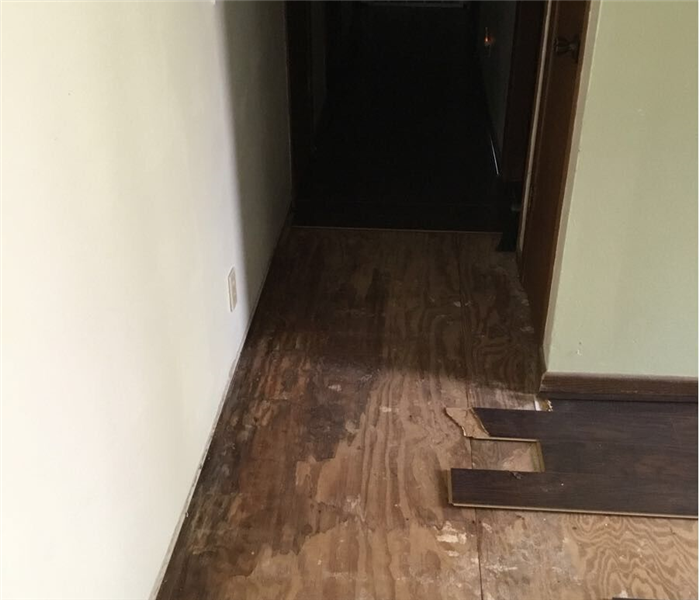 The picture shown is a result of flood damaging a home to the point where we had to strip the floors, lower portions of the walls, and insulation in order to replace them. Do not be scared! 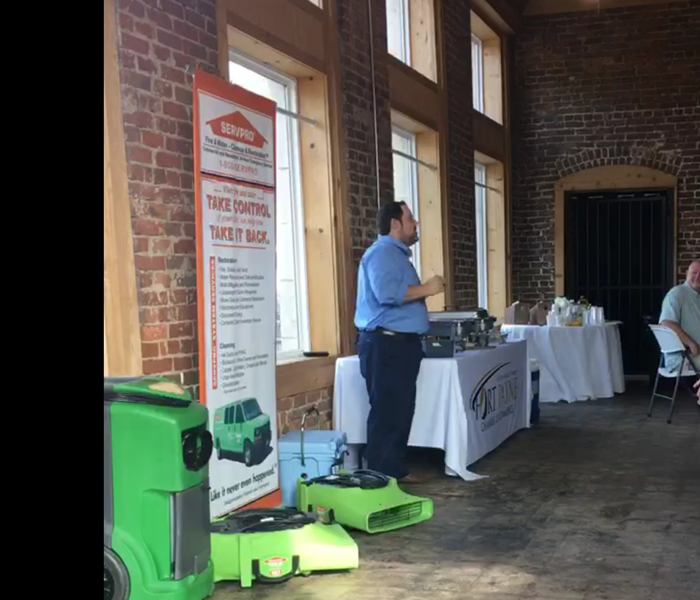 SERVPRO of Chattooga, Dade, and West Walker Counties is here to help you with your water problem! Call us today at (706) 866-5646! Mold, whether active or inactive, becomes a threat whenever there is an unregulated flow of water within the home. Mold spores need a moist surface to thrive on. Unsecured pipes, leaky roofs, or even condensing water vapors can create these areas where mold can easily grow. Condensing humidity in your attic can lead to serious mold growth that can spread to everywhere in your home. Think you See Signs of Mold in your Home? Do not be scared! 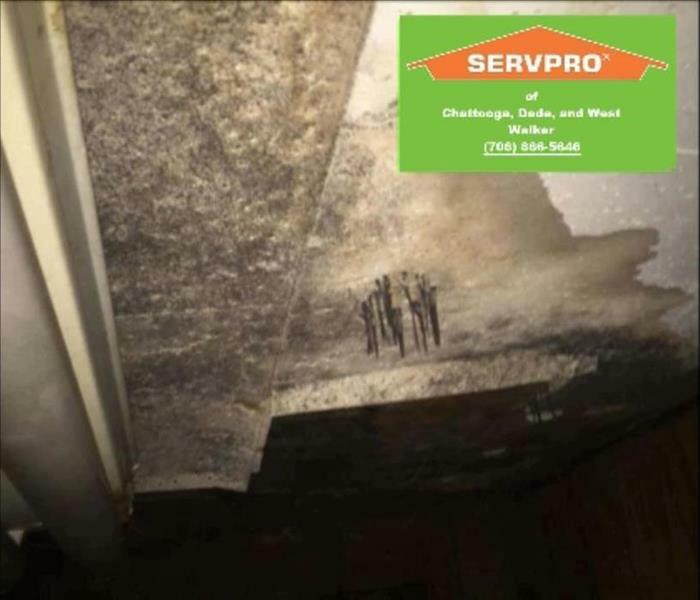 SERVPRO of Chattooga, Dade, and West Walker Counties is here to help you with your mold problem! Mold Can Be Where You Least Expect it! 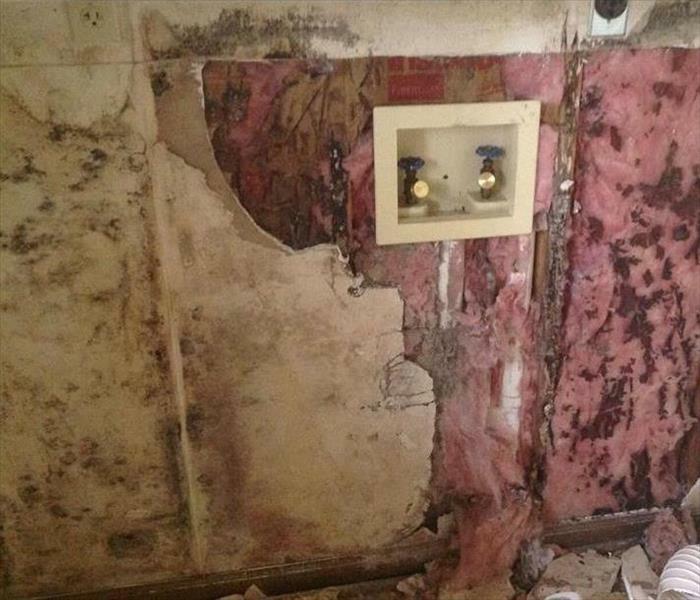 This photo is proof that mold can appear anywhere! When we arrived on location, there was significant amounts of visible mold in many places. As you can see in the photo, the mold is on the visible side on the wall. That almost always means that mold inside of the walls has already taken hold. In any case, do not be scared because SERVPRO of Chattooga, Dade, and West Walker Counties is here to help you! Call us today at (706) 866-5646! This was the aftermath of a busted supply line on the 3rd floor of a home we restored. 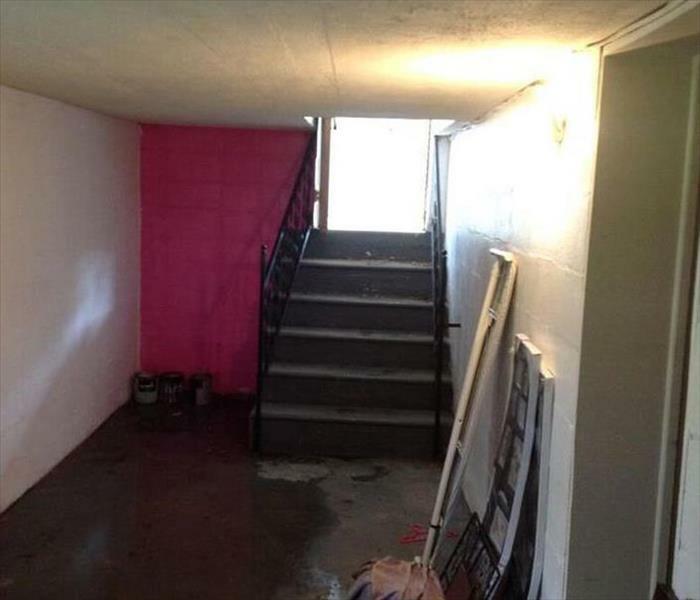 This home was in the process of being placed on the market for sale when this happened. Needless to say, the homeowner was distraught and needed help. We were able to properly dry the structure according to IICRC standards within 4 days. Because the extent of the damage was so large, and the home was vacant at the time the loss occurred, some structural materials had to be removed. We also performed the rebuild services on this home, and after 4 weeks from start to finish, the home was put on the market and sold within one week. 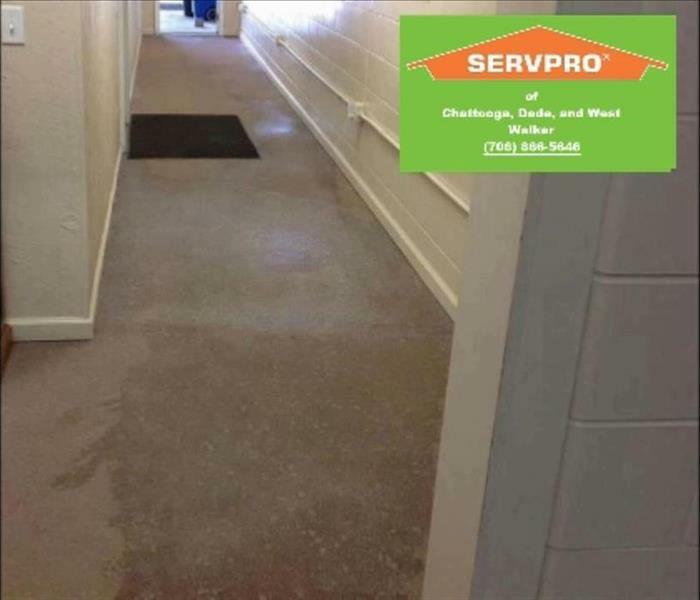 We cleaned over 70,000 square feet of floors, ceilings, and walls in this commercial building after normal business hours in order to accommodate the client. The building was over 30 years old and had never had this type of cleaning service performed before. The business was up against a time crunch as they had state auditors coming to inspect the building. We were able to complete this job in under 2 total weeks and the business passed their audit with flying colors. They have since decided to utilize our cleaning services quarterly in order to maintain a cleaner building year round. Having the ability to ramp up quickly helps you get your needs completed. 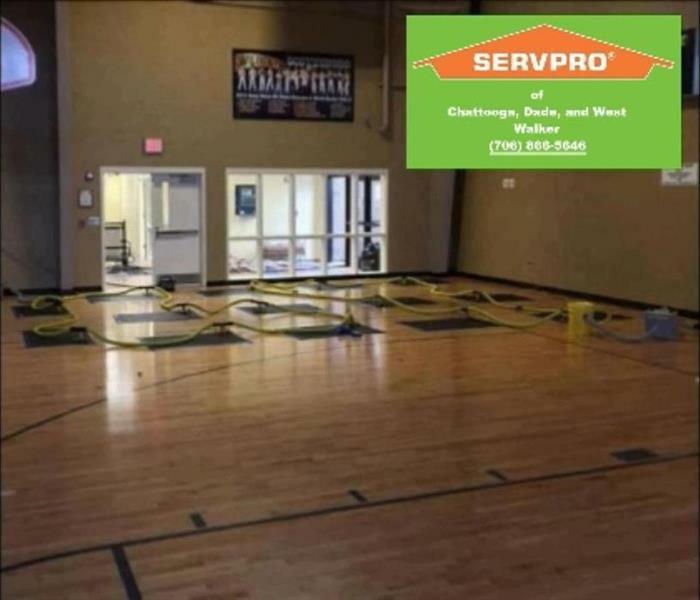 SERVPRO of Chattooga, Dade, and Walker Counties is part of 4 National Storm teams. When the need arises, we travel the country in order to assist with storm damage cleanup. 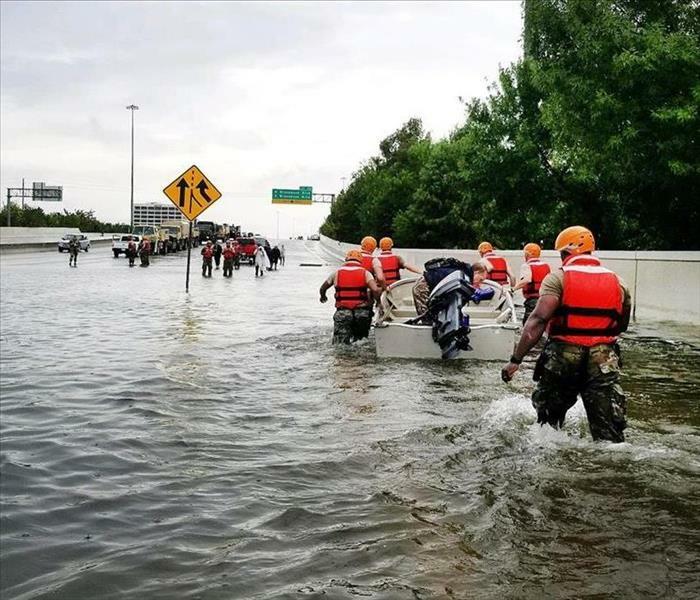 The pictured event was from floodwaters that devastated Houston in April of 2016. When floodwaters enter a structure, any porous material such as carpet and drywall is considered non-restorable and has to be removed. Contaminants from floodwaters can have serious health affects if not cleaned properly. Make sure to call a professional if you have had flood damage, or any other type of water, fire, or mold damage to avoid making a costly mistake. In July of 2013, over 10 inches of rain fell in Tennessee sending water roaring through the roads. 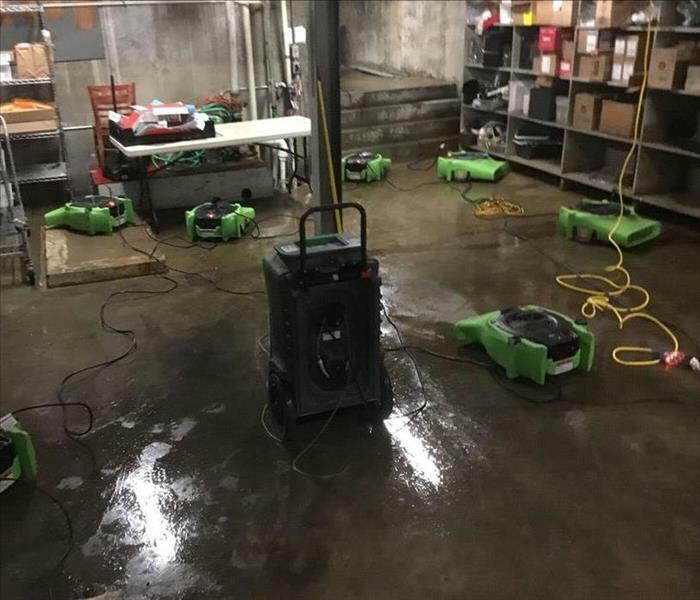 This commercial building took on over 4 inches of water, mud, silt, and debris in nearly 10,000 square feet of their building. Not knowing what to do, the owners called the SERPVRO national hotline. We were dispatched and within 30 minutes of receiving the call, were on our way to help fully loaded with equipment. After some good old-fashioned elbow grease, we began drying the structure to restore it to preloss conditions. After 4 days of work, we completed our services and the owners were back in business.